Suitable for evaluating two-electrode voltage clamp and discontinuous single-electrode voltage clamp. Contains two “electrodes” that can be connected to the “bath” or the “cell.” Connectors are suitable for U-type HS series headstages. Provided at no charge with all Axoclamps and Axoprobes. Simulates whole-cell clamp and single-channel patch-clamp conditions. Connectors are suitable for U-type CV series headstages. Provided at no charge with all Axopatches. Contains a series resistor and capacitor to simulate a bilayer membrane. Connectors are suitable for U-type CV series headstages. The MCB-1U is provided with the Axopatch 200A patch clamp. Simulates a whole-cell patch-clamp recording system. Connectors are suitable for U-type HS series headstages. Provided at no charge with the Axoclamp-2B. HS and CV headstages are connected to model cells through 1 or 2 mm pin connectors. We supply adapters on request that facilitate connections between headstages and model cells of different types. All adapters have a socket on one end and a pin on the other end. 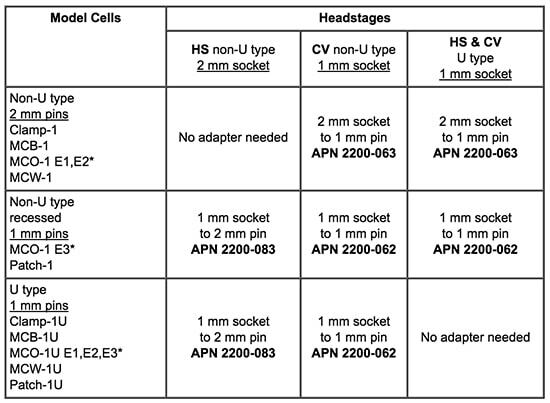 Adapter descriptions and Axon Part Numbers (APN #) are given in the table below. *E# – electrode input # All ground connections on model cells and headstages have 2 mm sockets, except the CV203BU headstage, which has a 1 mm ground socket. Adds a serial port to PC computers with only USB ports. 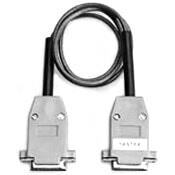 Allows use of the APN 2100-0623 PC serial cable for computer-controlled amplifiers. For use with MultiClamp 700A, GeneClamp 500B, and CyberAmp 380/320. 25-to-9 pin serial cable connects PC computers to computer-controlled amplifiers (MultiClamp 700A, GeneClamp 500B and CyberAmp 380/320). This null-modem cable requires a 9-pin serial port connector on the computer. Links computer-controlled amplifiers together, to allow them to run from a single serial port. Two-foot long “straight-through” flat ribbon cable. Connects Macintosh computers to computer-controlled amplifiers (GeneClamp and CyberAmp.) This null-modem cable requires a Macintosh-style serial port connector on the computer. Allows the sample rates of two Axoclamps to be synchronized. 2 mm plugs are used with the grounding jack of all headstages. These plugs also fit the input of non-U-type HS, VG and BH series headstages, and many SmartProbes. 4 inch (100 mm) long insulated rods screw into back of all headstages. 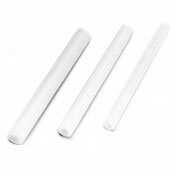 Replace “n” with diameter 1/4, 5/16 or 3/8 inch (6.3, 7.9 or 9.5 mm). RD-1-5/16 is supplied standard with all headstages. 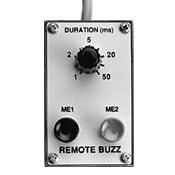 Hand-held control to enable the Buzz duration on the Axoclamp to be controlled in the range 1-50 ms. Provided at no charge with all Axoclamps. Normally provides a short-circuit link between the preparation and ground. Under control of an external TTL-level signal, the DR-1 inserts a 500 kΩ resistor in series with the bath ground. The DR-1 is suitable for finding the phase tracking angle in capacitance measurement experiments using an Axopatch 200B amplifier.